I dressed as Huey Lewis. I interviewed women who starred in Huey Lewis and the News videos. I met Huey Lewis (and some of the News). 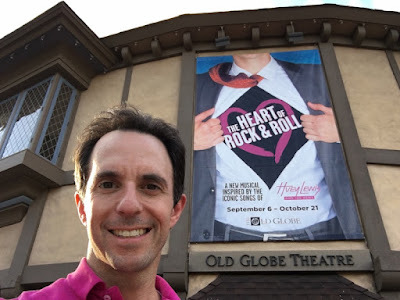 And now I've seen the new musical based on the songs of Huey Lewis and the News. 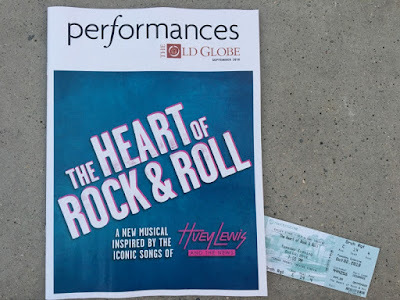 The Heart of Rock & Roll world-premiered in San Diego in September 2018 and is set to close in late October. As luck may have it, I was already scheduled to be in California during the show's run, but in Redlands, about 1.5 hours from San Diego. Still, not knowing if the musical would be successful enough to pop up elsewhere, I seized the opportunity. I flew directly to San Diego, drove straight to the show, and straight afterward drove into the night to my Redlands-area hotel. Bonus: This poster combines two things I love. The story was better than I was expecting based on a review or two I read, but of course this was not first and foremost about a story. The songs were the stars. I've rarely heard HLATN songs reinterpreted, so that was a rare treat. I was pleasantly surprised that the show included a few songs that were not hits ("I Never Walk Alone," "World to Me") and one song Huey wrote specially for the story. It was worth the side trip. It was hip to be there.